A massage, a temple to visit, a sunset at Big boudha! The villa we use to stay was exactly the same as shown on photos, of course with some time footprint. Every second day was the entire villa cleaned incl. the terrace and fresh towels were provided. Bed linen was changed and the pool was cleaned on weekly basis. All the villa equipment e.g. air condition, satellite tv, kitchen techs etc. were in perfect conditions and working with no one issue. Overall impression: very clean and nice. Marco is a perfect host with superb customer focus. At the late evening departure he was waiting for us and provided us with bottled drinking water and beer. The first day after departure Marco took us with his car on a sightseeing trip to show us the key places incl. beaches, restaurants and food markets in southern part of the Phuket Island. He also organized for us a boat trip to Phi Phi Islands for a perfect price with pick up directly from villa. We enjoyed the stay in this beautiful villa with excellent customer services provided by the owner Marco. Marco, once more thank you! "I am normally sceptical when reviews don't point out any imperfections about a property but I would really struggle with this immaculate villa. If i was picking I could mention the fact that there was building work going on on the other properties in the development, but we never heard any noise from the building work at all. Our Host Marco went above and beyond from the start, organising our transport from the airport, welcoming us with a choice of beverages and a fruit basket, providing us with a Thai phone and Sim card, arranging scooter hire for us and offering us his indepth knowledge of the island. He really helped us to land on our feet in Phuket, and as a consequence get the most out of our time there. The villa itself was beautiful and finished to an extremely high quality. Whether holding BBQ's or simply chilling out by ourselves at the poolside, we could not have asked for more. It is located in Chalong Bay which was handy for boat tours to surroundings islands, a short scooter ride to Big Buddha and within easy reach of the more vibrant touristy areas (Kata, Karon and Patong). This was my first trip to Thailand and i plan on going again next year and I know exactly where i will be staying"
Cette maison est un coin de paradis. Marco vous emmène faire un tour du coin. Attention quand même, l'autre maison est vraiment à côté. Il faut tomber sur de bons voisins ! 1/ Absence de lave vaisselle et de lave linge. Pour le linge il y a des laundry, mais attention au prix, celle proposée par Marc en profite, ne pas hésiter à lui demander le prix avant. 3/ Pour 2 semaines de séjour, le linge de lit n'a pas été changé malgré le passage régulier de la femme de ménage, c'est dommage ! Magnifique villa située à chalong, dans un quartier très calme et proche de tout. Très grande et spacieuse avec de magnifique chambres . Marco s occupe de tout de arrivé à aéroport jusqu'au départ à aéroport, une envie de visite ,un renseignement il répond toujours présent , au petit soin pour ses clients , qui a la fin du séjour deviennent des amis . 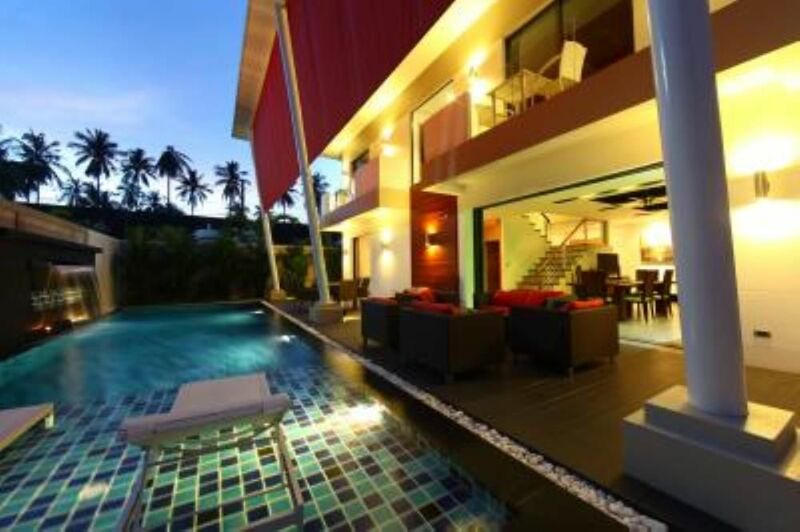 À louer les yeux fermés , vous ne serez pas déçu... Si je dois retourné en Thaïlande cette villa sera un passage obligé . Encore merci à Marco d avoir fait de nos vacances un moment au paradis . to visit the Big Bouda 3 km. Wearing CHALONG BAY 2 minutes for departures in boats to koh phi phi islands, koh lanta. Of seafood restaurants within walking ... good !!! lobster.